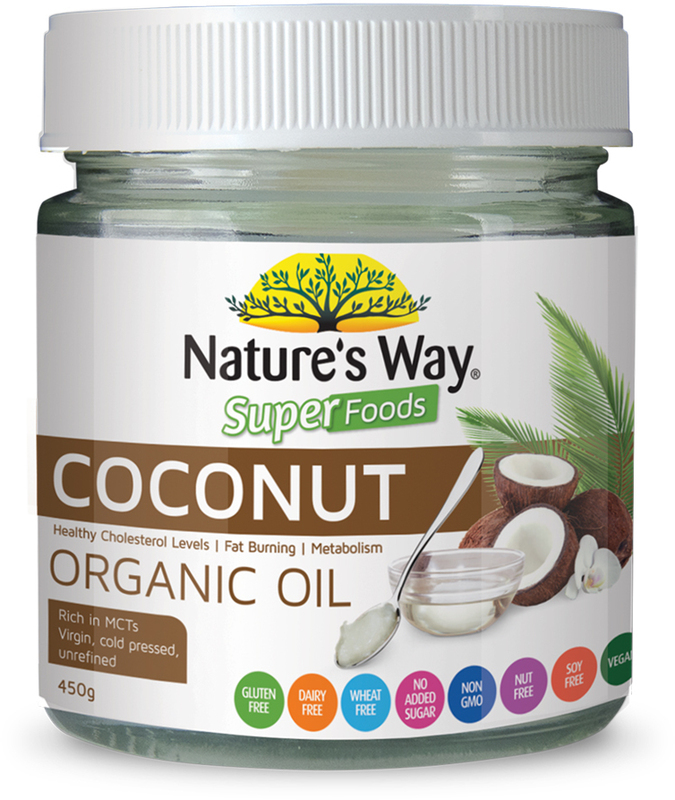 Nature’s Way Super Organic Coconut Oil is pure, unrefined and island-fresh coconut oil. The oil contains medium chain triglycerides (MCTs), smaller molecules that are easily metabolised and burned for energy. As a result, the body is thought to use coconut oil as a quick source of energy, making it less likely to be stored in fat cells. I always make sure I have a jar of coconut oil at home and tend to change brands a lot just to try things out. I've actually rebought the Natures Way coconut oil becasue I find it is really good quality. I use coconut oil as a hair mask before washing my hair, as an eye and lip makeup remover and also for cooking or baking. It leaves my hair super soft as a mask - I melt it to a liquid then leavebit in my hair for 30 minutes before rinsing with water and vinegar. Also as a makeup remover it gets rid of waterproof stuff while at the same time moisturising my skin and lashes. For cooking I love the flavour it gives to protien balls, for cooking curries and also to sub for a bit of butter in cakes for a coconut taste. When it comes to pure, virgin, cold-pressed coconut oil, there is only so much variety you can find between brands. It is a natural product and unless a brand sources it terribly, processes it extensively, or adds something to it, it simply is what it is. This coconut oil is organic, pure and has nothing added to it - it is a truly natural, truly pure product as the label suggests; and it being virgin and cold-pressed is vital. High quality coconut oil. I've bought many brands and the Nature's Way coconut oil is excellent quality as expected. I am a sucker for the jar. The price may be somewhat steep - you could get cheap off-the-shelve brands from the supermarket where you get more for less. But I don't use much in quantity and so how the product presents matters a bit to me as well. And I love the jar, I love how sturdy it is (and I am using empty ones still!) and I love how it blends in with my other Nature's Way products so well. I actually enjoy that it's a relatively "small" amount (compared to the bulk jars you buy from cheaper brands) because it makes the jar functional; you can actually get into it to get the product out really easily. The coconut oil has its natural, pleasant texture and smell. If you're okay with spending a bit more for a smaller but more functional and nice-looking jar, I recommend this. I just love this product. It is great as an all over moisturizer. Hair, lips skin, and it soaks in, not leaving the skin oily as you would imagine. I also of course use it in the kitchen - vegetables roasted in coconut oil are super tasty, plantains roasted in coconut oil really bring the taste of the tropics to the table. I even use it in baking as well, as it is a fat that is good for you. . I love this product. I keep one in the kitchen for cooking and eating raw and one in the bathroom as a multi purpose beauty product. It makes a great make up remover, a face mask, super hydrating moisturiser and hair mask. I use it all over my body on damp skin when my skin needs an extra drink and on my face after serum when my skin feels a little parched. It absorbs well and smells divine. It also makes a great lip balm and you can mix with sugar for a yummy body scrub! Love it. This is a must have beauty essential!!! Coconut oil is amazing for everything; scars, blemishes, makeup removal and even cooking! It leaves skin looking and feeling so smooth and hydrated. I like to use this oil on my face and neck after I have cleansed, as it removes excess makeup/dirt and helps re-hydrate my skin. It also has antibacterial properties, and is amazing for clearing the skin of pimples/blemishes. Great as a makeup remover! During one of many health kicks, I stumbled upon to miracle that is coconut oil. I initially purchased this product with the intention of cooking healthy meals, but it soon became so much more! Let's start with my hair! I'm the first to admit I have not been kind my poor locks and after multiple box dyes, attacks of bleach and endless heat damage, my mane had become a little worse for wear. That's where coconut oil came in. One night with a helping of oil combed through my hair (and shower cap on!) my hair was softer, smoother and more moisturised than it had been in years. From here the experiments keeps coming, I now use it as an all over moisturiser, a make-up remover, a shaving balm, a face mask, a lip gloss and yes, I even tried the oil pulling trick on my teeth! The product is so versatile that spending a little extra on it never worries me because I know I'll use it all! Keep a tub in the bathroom, one in the pantry and a smaller container in your bag! Trust me you'll be hooked! Useful for just about everything! Coconut oil has become a staple in our pantry as we use it for just about everything. It has become so popular and it's easy to see why. I use the coconut oil for cooking, whether I am just using the oil for frying or using the oil in soups and stews. The scent of the coconut isn't too strong but still fragrant enough to know that it's coconut. I prefer to use it as it is a lot healthier than other oils, is a great source of energy and it's versatile enough for other things as well. I have used coconut oil as a moisturiser for my body and my face. It's great as a makeup remover when my face is feeling really sensitive. You can use it has a hair mask on the middle and ends to help with hydration. I have even used it on my eyebrows to help with hair growth and surprisingly it has worked quite well. It comes in a jar with heaps amount of product so it will last a long time. I love this coconut oil. I currently use it as a makeup remover, and even with my combination skin, it works amazing. After using it my skin feels super clean, hydrated, and soft, but never oily. I also use it occasionally as a hair treatment/mask. Warming the oil up and putting it through the ends of your hair and letting it sit for a few hours leaves your hair feeling super soft and hydrated. Coconut oil is super versatile. It can be used as a makeup remover, moisturiser (face or body), hair treatment, and even for cooking. Don't use the same tub for all, though!